I've been put off because people close by in neighbouring villages have had terrible experiences. That aside, our street recently became virgin enabled. As in, they put light grey boxes around the estate. I assume they will need to run a cable to the house. Based on what we are speaking about in this thread, will this be a fibre cable vs the older coax? And if it is fibre, am i eligible for better speeds or is this still in pilot? VM's coxial/HFC is easily capable enough of supplying a 1Gb connection if they wanted to. 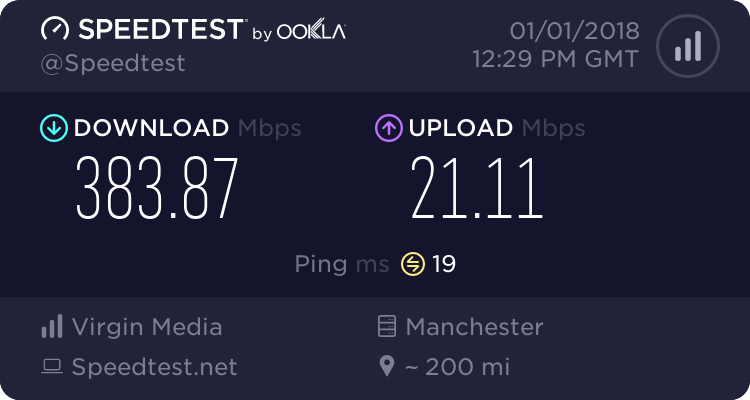 In fact they could give you 1200Mb down and 216Mb up - however this would mean having to kick everyone else off your local node as that is the total amount of bandwidth that is currently shared on areas with 24 channels. FTTP is converted to coax at your property, my cable run from the cabinet is bout 10m - some FTTP installs have more coax running from the entry point in the home to the router (depending on where you put it) so in reality there's not much difference in either at the moment. VM have, at most, 6 upstream channels active in an area, not 8, and they only allow bonding of 4. 24 channels is rare. 32 is a more common number now. Gigabit will probably have to wait for DOCSIS 3.1 which isn't that far away now. Building better networks, not just faster ones. I think Ignition might be referring to the areas having 32 channels available but I think the Super Hub 3 can only lock on to 24 of them. Is this correct Ignition? I believe the Super Hub 3 can support up to 8 upload channels though, even if VM don't support this. Yes, Sir. The Hub 3 is a 24x8 modem. The new kit will be 32x8 + at least 1 x OFDM block in each direction so will be able to deliver 1.6Gb/s of 3.0 + whatever they offer over 3.1.